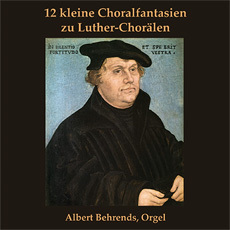 The “12 Small Organ Fantasies in the Ancient Style” presented here based on the chorals of Martin Luther were composed by A. Behrends for Luther’s anniversary in 2017 and were played and recorded at the Furtwängler-organ of St. Peter’s in Buxtehude in May 2012. “… The old stylistic devices are being rephrased: established and familiar twists are avoided, the old ways are deliberately broken with and sounds are being combined in a way which was, according to the old rules, to be strictly avoided. Character pieces were created which, despite all their freedom, are strictly based on the text and melody of the choral as a source of inspiration."